Two ballerinas are seen dancing here in 'Two Dancers On Stage' by Edgar Degas (1834-1917). One of the founders of impressionism, Degas was an artist whos style reflects that of impressionism of Monet and van Gogh. His subject here are dancers and is one of his favorite subjects. His works of dancers include that of dancers practising and performing in a variety of situations and locations. Here, this piece shows his favorite techniques of highlighted detail and sharpness, contrasting with lightness, softness and overtly rougher paint strokes of impressionism. 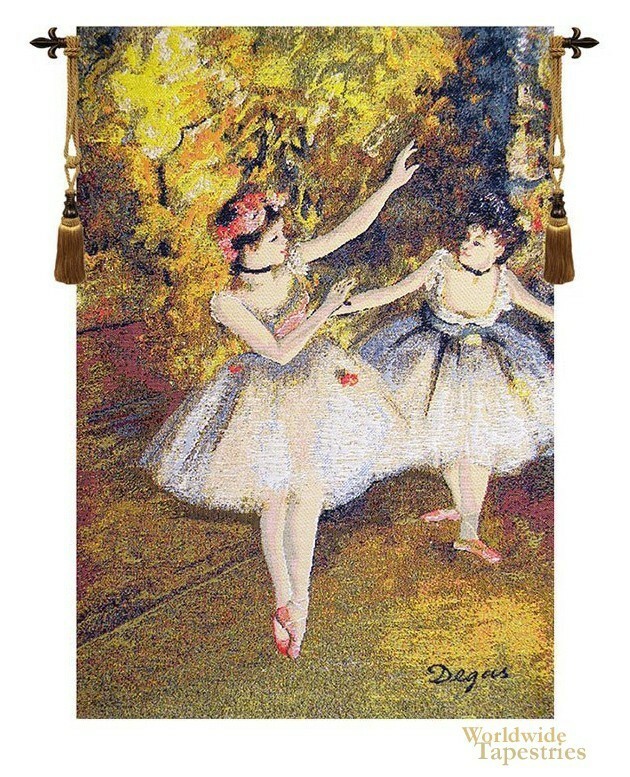 This art tapestry "Degas Two Dancers On Stage" is backed with a lining and has a tunnel for easy hanging. Note: tapestry rod and tassels, where pictured, are purchased separately. Dimensions: W 20" x H 28"
Dimensions: W 28" x H 39"
Dimensions: W 39" x H 55"